Running on Pixie Dust: Happy Birthday Brody and Caleb! Happy Birthday Brody and Caleb! It's a big week in our house as both Brody and Caleb celebrate birthdays - Brody is turning 5 and Caleb is turning 2. Each year when I plan their birthday party, I try to work in a little Disney magic. This time around, I broke out some creative energy to throw a Figment themed birthday party at Port Discovery Children's Museum in Baltimore. Port Discovery has three floors of interactive fun for kids of all ages. It really is a place for imaginations to run wild, which is why I thought Figment would be perfectly suited. It turned out to be an amazing day with a lot of fun, some creativity, and a little touch of Disney magic. The Invitations - I designed custom invitations for the birthday party using the HP Card and Invitation Kit that I received as a sample as part of the HP Millennial Influencer Panel. The HP website made it easy to pull up a template and create the invitations. I used an image of Figment in the background and a Disney font that I downloaded to my computer to inspire the look. To draw in an extra piece of nostalgia from Epcot's Journey Into Your Imagination ride, I made Dr. Nigel Channing of The Institute, our special guest host. This also played well with the mad scientist theming that Port Discovery offers for parties. The Decorations, Food, and Cake - We were fortunate that Port Discovery is an amazing venue and they were providing balloons and table cloths. I purchased purple, orange, and yellow paper goods to mimic the colors of our imaginative dragon. The colors that Port Discovery used just happened to correspond perfectly with our inspiration. 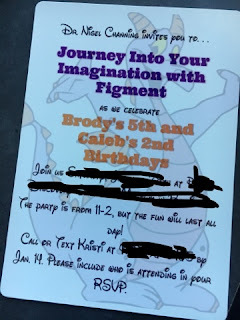 I wasn't sure how much table space we would have in their party room, so outside of a framed invitation, I really didn't bring other Figment decorations. I did however Disneybound with a Figment look for the day! We decided to keep food simple - ordered some pizzas, served bags of chips, grapes, GoGo Squeeze applesauce pouches, juice boxes, and bottles of water. The cake was truly out of this world. Brody came with me to Starry Night Bakery in our hometown to help pick out what he wanted. I originally was going to do white icing with a picture of Figment, but Brody wanted purple icing with orange writing and borders. I think his idea turned out better than what mine! The cake didn't just look good, but it was delicious too. Brody is a chocolate lover so the cake was chocolate with Oreo mousse filling. It was a big hit! The Venue - If you haven't been to Port Discovery and live around the Baltimore area, you should definitely check it out. They have a coloring room, water room, pretend Royal Farms store, indoor soccer field, and a whole half of a floor devoted to soft play areas for babies and toddlers just to name a few. The favorite spot though for my oldest is the three story indoor playground - complete with rope ladders to climb, bridges to cross, and big slides! They also have some areas of the museum that feature visiting activities. The current visiting attraction is a Thomas the Tank Engine play area - perfect for my little boys. Kids can dress up as engineers, load the train, play interactive computer games, and even enjoy a expansive toy train layout. We bought a family membership to Port Discovery last year after our first visit because we knew we would enjoy coming back time and time again. As members, we received a discount off of our party package and our membership for the upcoming year was renewed. The party package featured a make your own slime activity that gave everyone their own bag to take home. Port Discovery also gave BOGO admission tickets out to party guests as favors. Overall it was a wonderful day! 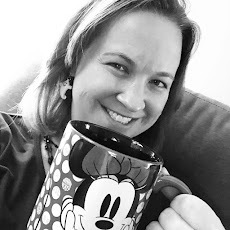 We again had the chance to show our Disney side with a Figment inspired party while enjoying all the fun that Port Discovery Children's Museum has to offer. Can't wait until next year when we can plan another memorable birthday party for the boys. Happy Birthday Brody and Caleb!